Six sterling silver ring boxes, circa 1920 to 1930s. Three round Birks Toronto Canada measure 2 inches wide x 1.75 inches high and one square box is Birks measuring 1.75 x 1.75 x 1.25 inches high. 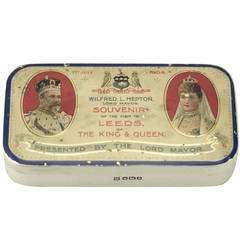 Two other square boxes are stamped from England. Larger one has B & S, with an anchor, lion and A. it has the initials BB engraved on top and measures 1.38 x 1.75 x 1.63 inches high. The other square box is stamped sterling pat. And a tree stamp measuring 1.25 x 1.25 x 1.13 inches high. 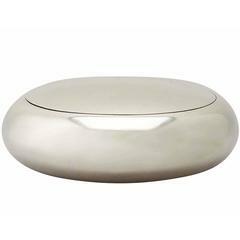 Birks sterling silver ring box. Rings pictured are not included. 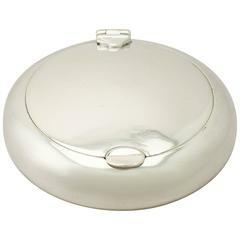 Pair of Birks sterling silver ring boxes. Birks pierced sterling silver basket. 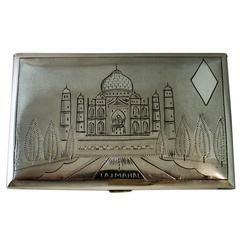 Silver cigarette case of Taj Mahal.